I've shared a few times on the blog that when I really like something, I tend to buy multiples of it in different colours. I'm trying to really question my "need" for this, to reduce the size of my wardrobe. I wore two cute little jersey dresses a couple of days ago, with the goal of picking one to keep and one to remove from my wardrobe and add to the donate pile. Brisbane was tipped to get over 40 degrees Celcius (104 Farenheit for my American readers), so I wanted to wear as little as possible. A bikini was out of the question though, haha! 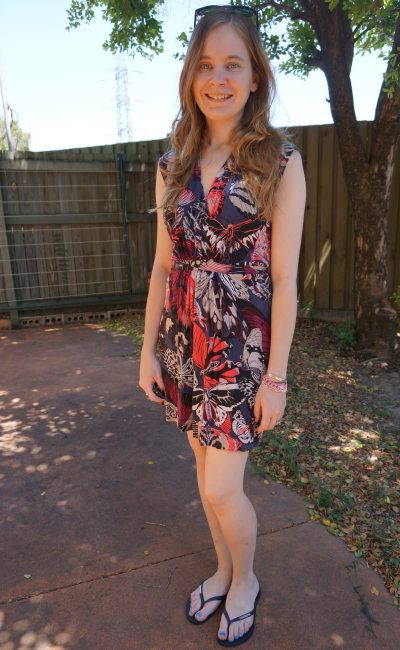 I picked this cute little printed dress as it's great in the heat. We all headed over to my parent's place for the day, to sit and soak up their air-conditioning and protect baby T from the worst of the high temperatures. I did add a cute little bracelet to accessorise a bit, but it was really too hot to want to do anything to wear this dress differently! Didn't even take a bag - had all my stuff in the baby bag. Last worn: Ray-Ban Wayfarer, printed jersey dress, Havaianas. Wore this second dress simply too, just added my trusty pistol boots. I know that when the summer heat comes to stay, I won't be wearing them very much, so I'm getting all the wear out of them I can now in Spring! Simple outfit to go visit a friend for a chat with baby T.
I've worn this dress 9 times since I've been blogging, and the butterfly printed one 7 times. Not sure how long I've had them, although I do have an old picture of a night out in 2008 wearing one of them. They've both had a good run in my wardrobe, but as I'm trying to downsize, getting rid of things I have multiples of seems to be a good way to go. I picked this burgundy star print dress to wear after the multi coloured printed one above, as I was certain that this would be the dress that would be leaving my wardrobe after looking at them both hanging up. However, after wearing this dress, I've decided to keep this one and donate the more colourful printed one above. 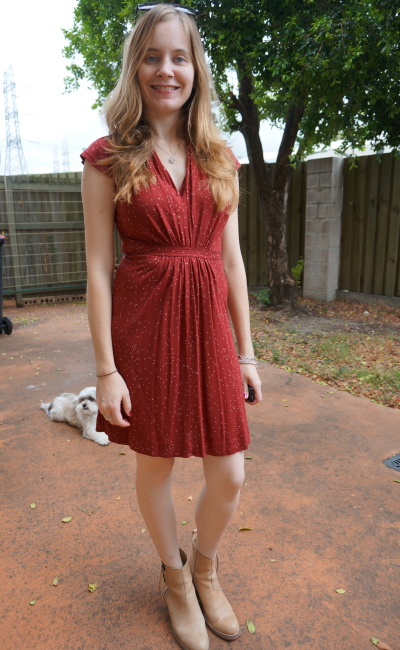 I just love the burgundy colour of this dress too much! What do you think? Would you have kept this burgundy star print dress as well, or do you think I should keep the more colourful printed one? Last worn: Wayfarers (see above), star print dress, Acne Pistol boots. The Iconic Shop More, Save More sale. Get $15 off $100 with code 'SHOP15', $40 off $200 with 'SHOP40' and $100 off $400 with 'SHOP10'. Bloomingdales Big Brown Bag sale - up to 50% off. Modcloth - 50% off new arrivals. No code needed! Nine West (US) - up to 50% off. Hope all my American readers have a lovely Thanksgiving! Linking up with What I Wore, Style Me Wednesday, Thursday Favourites today. I think they are both really nice dresses, but I probably would have picked the same one you did. That red/rust colored one looks great on you and isn't quite as "busy" with the print so I think it will be more versatile. I especially love the burgundy one! It's adorable with those booties and it fits you perfectly! Mica I think you should keep both. Funny thing coming from someone like me who is always cleaning the closet - but, they both look really good, can be dressed up or down, fit well, don't wrinkle, can be layered… give them another change. Mica!! These dresses are so PRETTY!! Such flattering fits and designs. I hope you're staying cool! Yes I need to be tougher at implementing that rule! :) Maybe next year, after I've gone through the year without the baby bump affecting my clothing choices! They are both so different, I would have kept them both! I am from the "if the dress/top/pants fit really well, buy them in all the nice colourways" school but this is often just a plain colour, so I sometimes feel like I'm just wearing the "pink one" or the "grey one" and they're not as unique pieces. I do that too - I have so many multiples in my wardrobe, but it's true it means they are less special if you have too many! Loving your two short and flirty dresses in this post. That faux-wrap style suits you beautifully, Mica. Enjoy the Summer ahead of you! I love the second one too! Glad you decided to keep it. It looks great with your boots. I am not envious of your heat wave! Stay cool my friend. You're just adorable in everything, dear! I like BOTH of them on you! You wear prints well Mica! The color of the second one is gorgeous on you. Your hair looks SO BEAUTIFUL! haha thank you Kim! It was due a trim, getting a little unruly! Wow lovely dresses you styled both of them so nicely.